Categorized as: Stories on July 5, 2011. Reporting from Tanzania with The School Fund, an all-volunteer team of university students and recent graduates who raise funds for high school students in developing countries, we meet a young man who turned his life around because somebody believed in him. 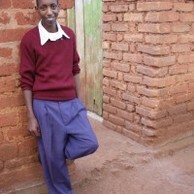 Read about Eliazeri, who got back into school with a little help from a whole community, here. Photo: 18-year-old high school junior Eliazeri Elihakima, now feeling that he is in charge of the future for himself and his family. Click on the link to our blog for photos of Eli with The School Fund team members Saeed and Matt.